‘Conversations’ is a special focus at PULSE Miami Beach in the South Tent highlighting galleries presenting dual-artist exhibitions. Within these booths visual dialogues are explored and extended by the artists’ actual conversations, captured here. Marnie Bettridge: I generally have two different types of work, the first is work that starts with material exploration, and that i struggle over and am indecisive about (and that i never really feel comes to fruition). The second type is more rare and that is work that pops into my brain almost fully formed. I believe the first type informs the second somewhere in my subconscious. This body of work is of the second type. I imagined them for a long time before i built them, and had a clear image of what i thought they would be when i started. Luckily factors such as materials, processes, and gravity inflict their will on my pieces too. Luckily because i feel if my imagination was so complete that the pieces came out how i initially wanted, I wouldn’t make them. It is the curiosity that drives me. Even with multiples, i long to see how they will be different or how they will look when installed together. The works are large ceramic pieces that are completed when installed. They can be hung, draped, or placed on a surface. The viewer completes my work, and i always hope that they might occupy it mentally while looking at it. 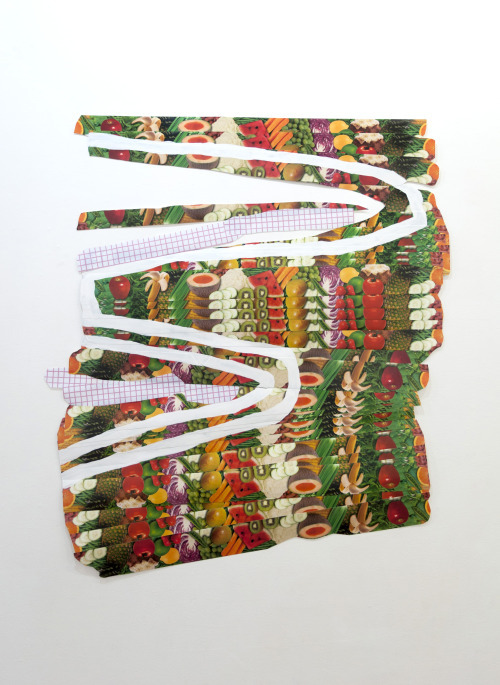 Megan Stroech: The work I’m bringing to PULSE is a mix of printed digital collages and found object collage/painted works. The digital works are a recent addition to my studio practice, where I pull images from the internet as well as scan in physical materials, and then layer and alter them in Photoshop. I’m still trying to reconcile how the digital works fit in or are in conversation with my other works, but I definitely think it’s fruitful territory for exploration into pulling in new content into the work. The larger collage works integrate landscape imagery and more recently, stock photos with found materials and paint. The overall forms often oscillate between space and object and I’m interested in how these forms and materials can create a play between 2D and 3D, as well as painting and sculpture. I often inject small moments of discovery or humor in my work, as a way of inviting the viewer to reference one’s own everyday experience, whether it be a connection to a specific material or a piece’s overall form. Marnie Bettridge: I have a background in architecture, which i believe shows through my work but i hope doesn’t overwhelm it. I studied for five years, worked at a new york firm for a handful more, and then went back to school to study architectural theory. I don’t have the personality of an architect– i love math and physics and details, but am not one for due diligence or over structuring. I never actually desired to become an architect architect, but i was really attracted to the studio atmosphere and learning process that architecture schools support. It goes, design something, draw it, talk about it, change it, defend it, repeat. And simultaneously, look, look, look. Because the subject matter is so serious, the conversations had an intensity i did not find in art school. I think my use of scale and monochromatic materials betrays the amount of time i spent building museum board models in my youth. I came to making art by first longing to do so while a cad monkey in nyc. I desired the autonomy of a maker. Then when my mother had a near death experience, and i spent months nurturing her rehabilitation, i had a long time to ponder what i really desired to make, and nothing functional seemed right. I found an MFA program close to home so i could still help my mother during the day and worked in the studio the program provided at night. Megan Stroech: I’m originally from South Texas, I received my BFA in Studio Art at the University of Texas at Austin in 2008 where I focused on photographic lithography and monotype printmaking. I then went on to receive my MFA in Printmaking at Illinois State University in 2012. While I started the program producing more traditional prints, in my second year I began integrating more collage and painting into the work and my use of materials has evolved ever since. My family has always supported my creative pursuits, and it wasn’t until after receiving my BFA that I began to consider making art as a serious profession. Marnie Bettridge: I am trying to create a beauty that a human can create, with my hands and my brain and my heart. I am also trying to express a frustration with society’s lack of appreciation for beauty. I know everyone loves a supermodel, but I mean that i believe a good solution to any problem will have a dignified, simple, poetic beauty to it, whether that is in the math or the balance or the scale. I see too much laziness of thought and shortsighted prioritization in very important places, and it drives me a little crazy. I want the built environment to show thoughtfulness down to the simplest thing. My work also has something to do with an inner frustration about how quickly things are changing to support the amount of life on the planet. Or worse, for the sake of making money or greed. I feel powerless in this frustration of bigness and ugliness, and i find solace in making tiny beautiful things. Megan Stroech: My process when creating an artwork is rather playful. I’m often on the floor of my studio arranging and rearranging materials, considering how these different found items relate to one another and what relationships can be conveyed to the viewer. I alter the materials by obscuring their shape additively through the use of paint, or by physically subtracting parts of the overall form in order to redirect their function. I’m interested in pulling together familiar items that the viewer can identify and has a previous relationship to, subverting conventional understanding of the material’s utility in order to spur new conversation between them. Marnie Bettridge: I love beauty in material, and to me, beauty is linked to a healthy life cycle. Ceramics is one of my favorites, because the clay body is completely recyclable until you fire it, and then it is archival. I try not to fire anything i won’t use, but mistakes do happen. Even fired ceramics can be milled to powder and returned to a clay bodies. I also like to use materials that are overlooked or under-appreciated. Materials that are simple, of the earth. Materials that have less healthy life cycles i try to find second hand or get from my local refuse facility. Megan Stroech: I carefully seek out the materials I use in my work, sourcing mostly from discount or hardware stores in Chicago. I am interested in the shift in context that happens when pulling these everyday objects into my work. When integrating these objects into the work, their placement often relies on color and formal relationships within each piece. I’m not sure that my relationship with the materials has changed, but I have allowed myself to pull in items I wouldn’t have used previously, often referencing the figure. There is also an economy of material and mark-making in my recent work, I try to be very purposeful with each aspect of a piece, being mindful of elements seeming decorative or arbitrary in their placement. I think especially in work from the beginning of graduate school, areas became very repetitive and I find myself now being very conscious of that. Marnie Bettridge: I have a really hard time generalizing about the art world. Was it Saltz who said they were actually seven art worlds? My studio is sort of in the middle of nowhere rural north florida, and i work very isolated. I love art, but i love one percent of it ultimately, and i suspect that is really how everyone is. So then it is super personal and about finding your world. That’s how i knew Rockelmann & was a good fit for me as a gallery– they had so many artists i really loved. Megan Stroech: I’d say I’m still very much becoming acquainted with the art world and trying to find where I fit in it. I’m becoming pretty familiar with the art scene/community in Chicago and I feel that it exists in a very different space than those in NY/LA. I’m eager to see how my work is perceived to a much larger audience at PULSE. Wyatt Gallery: Hi Simon I find it very exciting that we both create work that makes each other ask How are they making this?! I’ve wondered the same thing about your work many times! Mine are photographs of existing subway advertising walls where the ads have been found temporarily removed to reveal decades of layers of wear and tear created by unknown employees installing and removing advertisements. I photograph the walls in vertical panels then re-stitch them together in Photoshop. I then remove the white subway tiles that border the alcove wall. That’s the only manipulating that I do. Otherwise it is a straight document of what I find. I then print them with a relatively new technique called UV Ink printed on to white DiBond. So the ink sits on top of the aluminum and gives an actual three-dimensional tactile surface. Blurring the line between photograph, painting, and sculpture. What about you? How do you make those white pieces? I haven’t seen your new work? What’s that like? Simon Schubert: Hi Wyatt Thank you for the info! Very interesting. That`s in some way how I thought you would do these works. It will be a pleasure to show with you at Pulse. The white works are made by folding the paper. The picture becomes visible through the light on the ridges of the folds and the shadows they cast. The exact way of working is a bit of a secret, but I use metal tools to get the folds into the paper and have a certain chronology of different steps in working on the pictures. For me it is very important to reduce the material to just the paper and use the light to visualize the picture. The works that are at the gallery include light that is shining through windows in the pictures. So the picture itself becomes visible through light and the light is thematized in the pictures. I like that through this, time becomes a part of the work through the wandering light on the floor and walls in a series of pictures. For the show I`ve done some researching on the places where Edgar Allan Poe used to live and tried to approach the work of Edgar Allan Poe from architecture. Some pictures show places where he used to live and some are fictional resembling places that could be part of his stories. Seen from a larger scale I work on the idea that all the white pictures, all the interiors, are part of a large building that is growing with every picture and the beholder wanders through it step by step. I also started to do “black” works two years ago which are kind of a negative to the white ones, as they are covered almost completely with graphite (and for the white ones no pencil or color is used) and they mostly shown burning houses. 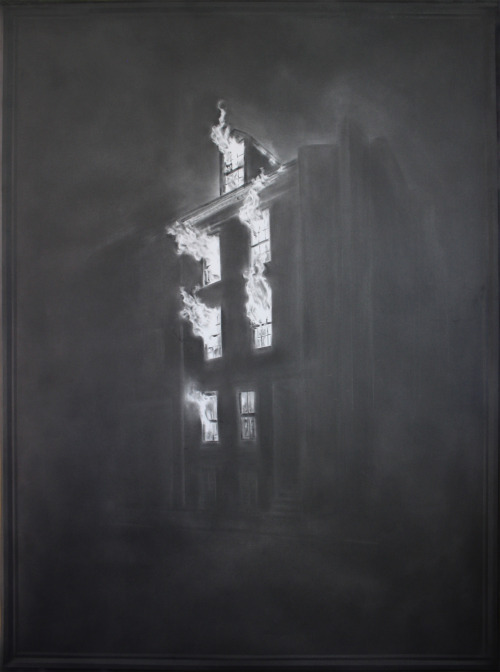 The flames of the burning houses or other sources of light in the pictures are done through leaving them white on the paper and erasing on some points. These works also deal with light in a different way as the white pieces as the light in the pictures begins to shine through the contrast. I studied in Dusseldorf at the Academy of Fine Arts and came to be making art through my interest in drawing, which started during childhood. During my studies I developed the technique of folding the paper. It took a few years to perfect the technique. The first works where inspired by the texts of Samuel Beckett and I was looking for a way to link to Beckett and the way he was dealing with language, reducing it to a kind of essence. I was trying to find something similar for drawing – reducing the material and the image as far as possible. Over the last twelve years I`ve done different series of works, that are inspired by literature and film and art. So that ́s a little fast survey about my work of the last years. Wyatt Gallery: You are a true surgeon in your skill of folding. What an amazing process with beautiful and subtle results. It will be interesting to see our work next to each other, both using paper as the subject. Maybe not the subject, but the source. For me the decaying walls that live beneath the glossy advertising campaigns also symbolizes each one of us as we often times portray a perfect outer shell yet beneath the surface we have wounds, wear and tear, and so much history. This history, built from the combination of challenges and celebrations, is where our true beauty exists. Our inner beauty built from life’s ups and downs, similar to the remnants created by countless pastings of pretty advertisement posters and the tearing away and painting over it of it to install a new one. Layers after layers built up over decades by unknown hands. I started noticing walls in NYC after returning from photographing Hurricane Katrina. In New Orleans, first the muddy water flooded the homes and left high waterlines and stains on the walls of people’s homes and personal spaces. Then the mold took over and left a new pattern, both created without intention and yet giving a portrait of the people of these environments without ever showing the people. I have no control in the physical look of these walls. I just transport them to a new environment through photography. So it may seem as my work has changed with this new project SUBTEXT, but really it is just an extension of documenting the aftermath of places that have been torn apart unexpectedly, and seeing a haunting mysterious beauty in this destruction. I normally photograph in the middle of the night when the subways are more empty. In order to get the entire wall in the shot, I take multiple exposures as verticals then later stitch them back together to recreate the whole wall. I never remove any ads that are up. I only photograph the walls where I happen to find the ads temporarily removed. Simon Schubert: Thank you for the explanations. Sounds very interesting and I would love to accompany you when you go hunting for a good picture in the night. You probably know the work by Jacques Mahé de la Villeglé and Raymond Hains, who used to work with a Décollage technique removing part of the layers from advertising walls and creating pictures through this at some time in the fifties in the last century. I think your works are linked in a way to these artist’s works, creating a somewhat related picture, but approaching from a completely different point. It is great how art history is present in your photos but you create something entire new. I love that, as contemporary art is surely based on art history! Love to show with you! Roy: The work that I will have in the James Harris gallery booth at PULSE is a small selection of paintings, collages and sculpture. As is the case for many years, my work if a hybrid of a broad range of sources and influences, from world cultures to design, advertising, folk art and both art historic and contemporary practices. I am a collector, both literally and figuratively, if it is our there, I feel I am to us it, and I do. Although I feel that it is reconfigured, re-purposed and reinterpreted into a very personal and individual language. Squeak: the work of mine that will be in the booth with be examples of the two kinds of painting I am most involved with for over 20 years, I have always made images paintings and word or language paintings. Both kind of work are about way finding, or orienting ourselves to being. The language paintings have mostly been definitions of things, lists, and some very brief narratives about science, thinking, current events, or thoughts that occur to me while I am painting. Painting and art for me is a way to build myself as human. Our identity is a creation of our experiences, feelings, our past, our DNA, our environments, and our own highly developed belief systems (and that is probably just the short list). Art-making teaches us to take risks and to trust our own instincts, and for me my own wacky intuitive leaps. I often say it is a way to learn how to trust and to be brave. The two bodies of work exhibited in the James Harris booth are recent incarnations of the language and image paintings. The language painting in this series are called the song paintings. 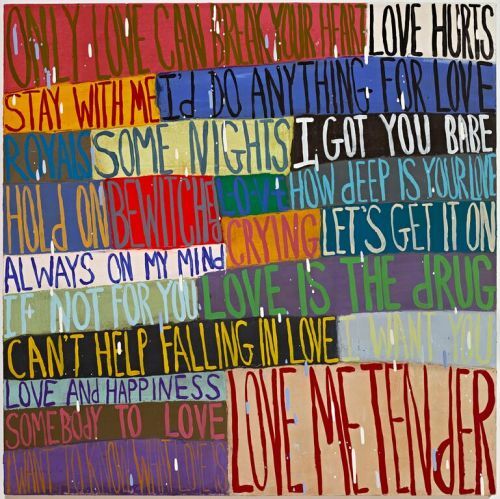 Each of the paintings are made up of blocks of color with sing titles written in each rectangle. A LITTLE LOVE, is a group of love songs by various artists. ALMOS PERFECT is a painting of an almost perfect play list. In a way I am DJ-ing. Each of the song paintings comes with the complete playlist plus some bonus tracks loaded onto an ipod shuffle. I love to listen to music in the studio when I work, as well as TV or movies depending on what I am doing. These paintings form their own poetry in the way in which one reads the various song titles. The current image paintings are influences by my “drawings” or as I call them “the crazy papers”. They are notational and snippets of information. Notes to self, interspersed with images that are of interest to me. I see them as maps of how we think neurological pictures. The works which fall into the images pictures are: OUR REALITY, I WISH, and LIGHT. Roy: I attended the California College of Arts (and Crafts) from 1969 to 1971. In 1973 I received my BFA and in 1975 my MFA both from the California Institute of the Arts. I have continued to live in Los Angeles since then and presently have studios both in Los Angeles and in Mexico. I had, as long as I can remember, wanted to be an artists. My grandmother and my mother had both attended art school as did my aunt and one of my cousins. Squeak and I have never met although I have been aware of and have admired her work for many years. Squeak: had no idea we were there at CCAC at the same time. I however, did not graduate. I dropped out because I realized there were no jobs for artists with a BFA. I had already been to two other schools. A two year women’s college, since shut, and Goddard college in Vermont. I had already been in college for almost five years. I also thought that if I could get a portfolio together and get my work shown, that I could apply and qualify for grad school by virtue of having acquired some “real life experiences” as long as it was in the field of art. When I was ready to apply to graduate school, I applied to CCAC. but first I asked Viola Frey that if I were to apply, would I get in. because I did not want to waste 25 dollars for the application fee if there was no chance. It is a good thing I did so because the other school I applied to was the San Francisco Art Institute. I did not get into their program. I was however accepted into the MFA program in the ceramics department at CCAC. i loved grad school. I worked in 3 different departments, sculpture, painting and ceramics. As an undergrad I worked with Viola Frey and again as a grad student. I also worked with Dennis Leon in sculpture and Jay DeFeo in painting. Thanks to Viola Frey accepting me into grad school, I had a teaching job in the UC system for over 26 years. I got tenure twice, first at UC Davis and then when I left Davis and became a professor in residence at UCB, I got tenure after a few years teaching at UC Berkeley, all thanks to Viola Frey! Roy, you are so lucky that you had family members who were artists and interested in art. ROY : My process is, for the most part an intuitive one albeit a very researched and studied form of intuition. 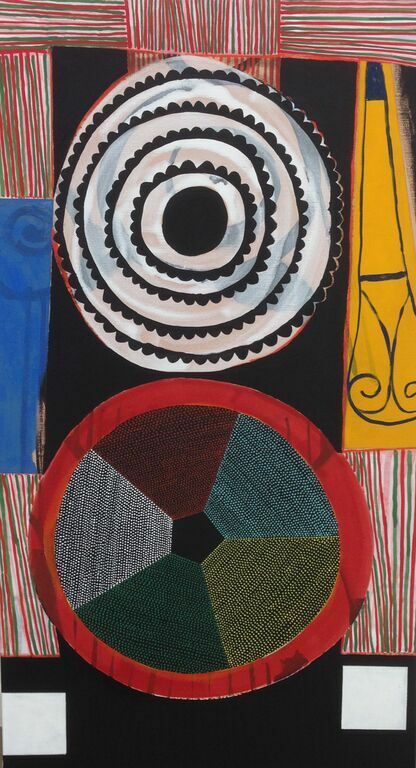 My collages, paintings and sculptures all inform each other. Recently I have also been making mosaics which seem to function as a meeting point for all three of the other forms that my work has taken. My paintings and collages are pictures, not objects. Although I am interested in their physicality I am more interested in what they depict. SQUEAK: My process is also very intuitive although I am interested in the history of painting and I use it because it is a traditional art material. Even though my MFA is in ceramics, I have been painting (with oil paints) since the fifth grade, when I took a class in oil painting. I am interested in color and how it affects us beneath language. i am interested in the things that only oil paint can do. I was not really taught to paint. Teachers often spoke about light in paintings but they never really showed us how to achieve it, they did not teach all the traditional methods of paint handling. It was the sixties and students we left to simply express themselves. I have always been interested in self expression but when I started teaching I thought I should show the students various techniques I had learned by looking at paintings in museums and by reading, and so I gave lots of demonstrations so that students would have more skills than I had gotten in undergraduate school. The thing is no one can really be taught to paint, everyone has a distinct sense of touch and that tactile ability is how artists make unique marks. One of the reasons I admire Roy’s paintings and works on paper is because of their authentic and unique approach to color and form. The work has a vitality and freedom that I love to see in artwork and it doesn’t look like anyone else’s work, and I want one!!! ROY: My relationship with materials is guided by a desire to keep things as simple and direct as possible. My sculptures, for instance, are made primarily of cardboard paper and paint. The collages are constructed of both found materials as well as scrap that I have made, no technology other than paper, paint, scissors and glue. My work tends towards an intimate scale. I want my audience to have a one-on-one relationship with my work, bringing their own interpretation to it. I want the viewer to apply their own experience, sense of recognition and decoding. There is no “correct read” of my work and it serves no purpose other than to challenge and engage. Squeak let’s talk about a trade. I’d love to have a piece of yours as well! SQUEAK:I love all the materials and tools that artists use. I think of myself as materials sensitive. I love to figure out ways to use paint. I can spend hours looking at traditional paintings in museums to try and figure out how the artist made the work. i have very catholic tastes when it comes to art. Rembrandt, Watteau, Susan Rothenberg, Ingres, Peto, Harnett, Louis Bourgeois, Marlene Dumas, street art, Forrest Bess, Amish quilts, Gees Bend quilts, Shaker drawings, Hilma af Klint, Duchamp (although i don’t think of him as having a very sensitive touch, he is completely idea sensitive), Matisse, Cindy Sherman, Tom Nozkowski, Catherine Murphy, gusto, Manet, sober, the list goes on and on and on. I also love anything demotic, homemade handwritten signage: because of how the handmade activates and emotionalizes language. Like Roy, I am also interested in the intimacy of art. For me, the act of looking and serving is an incredibly intimate act. It is usually something private in mostly public spaces (except when one is a collector who owns the work). So, for me it also possess’ a sexual frisson, because staring is close to fetishistic. Also color, texture, form, scale, line, imagery, sets off signals in the brain that like scent remind us of past memory and things not named only felt with no language to describe and the forgotten. I agree with Roy, that the viewer/beholder is free in fact required to bring something to the act of viewing the work. There is no right answer and like the many ways in which humans have expressed themselves since the first cave paintings, there are as many if not more ways to experience what one sees in an artwork. In other words, how one interprets or “reads” an artwork. The viewer/beholder may not be able to articulate what that experience is however given the space, time, and permission, they can recognize and respond to the authentic. Unlike Roy, I am not a sculptor. I have made objects, but they are always tied to the primacy of painting. Basically I am a flat worker. When I was a grad student I made things that might have been called sculpture however, they did not displace space and were essentially fallen paintings, things that were viewed from above. These works were really a way for me to develop a kind of cellular memory and taught me about my own form making in paintings. Lately, I have been making paint boxes which are really a way for me to recycle paint gunk and turn it into something else. For me painting is the main thing. I love that it is a thin film of stuff with a binder that allows it to stick onto a flat surface. I believe that painting is a philosophical enterprise and that it has the capacity to appear “real and believable”even though it can’t be bumped into the way a chair can be. ROY: The art world in Los Angeles has changed drastically since I left graduate school. It is unrecognizable. I think that the success of Los Angeles is found in the fact that for many years artist lived and worked without anyone looking over their shoulders. There were few galleries and those few that did exist were not so open to younger artists. In the 80’s that changed, suddenly (or so it seemed). The magnifying lens was held over the city and many of artists who had been laboring in anonymity were “discovered” and propelled into the public eye and many have remained there. Los Angeles has, with its many art colleges and art departments, (I am the founding Chair of the Graduate Fine Arts Program at the Otis College of Art and Design) and great public and private institutions remained a production center but it has also grown into a marketing center although still not on the level of New York or London. It seems like a new gallery opens up every week here. Many of the larger and well established galleries from New York and elsewhere are now opening satellites in Los Angeles to service those local (now international) artists that are doing so well. Los Angeles has been a relatively inexpensive place to live compared to other large art centers. Like New York, artists are being forced from the areas that they helped gentrify to locations much less central. SQUEAK: the bay area is not as evolved in terms of it being an art center. There are fewer galleries and, for me, less painting to look at. San Francisco has collectors who have fabulous photography collections or collections of video and conceptual art. Jeffery Fraenkel has done an amazing job of educating people about the nature of photography and he has managed to stay current with contemporary photography as well. His gallery does some amazing exhibits combining photography and sculpture and painting. Those shows have been lovely and are really museum quality. I wish more galleries were as open to adventurous curating. The less known and newer galleries do but I suspect it is a struggle for them to stay in business. Also the local newspapers don’t really have enough writing about the visual arts. There are some really great online publications, like square cylinder; there are younger artists who are doing terrificprojects of pop-up spaces and self publishing like the quarterly: the THING. Right now, SFMOMA is closed as is the Berkeley Art Museum, both for remodeling and new buildings. Like Los Angeles, it used to be less expensive to live here and find studio space. Now it is increasingly hard for recent grads to find affordable space to work or live. My husband and I were young and stupid and managed to find a building to buy. We only had enough for the down payment. Luckily it was owner financed…a bank would have never lent to us. People told us we couldn’t make it work, we did eventually and I feel very lucky and a little less stupid. Still, I could not replace the space I have if we sold the building, so I will have to be carried out feet first! Meanwhile, we rent space at below market to some terrific artists. I believe it is important to give back to the community and when possible make space available at reasonable rents so that culture can continue to be created in more places in America than just the bigger cities which are now becoming financially prohibitive to young artists. If the big developers in cities and small towns set aside a certain percentage of space for artists there would be more opportunities for artists, young and old. I have been lucky and had a teaching job which enabled me to save money, buy supplies, and pay the mortgage. Now universities and colleges are not hiring as many tenure track teachers, instead they are hiring adjunct faculty. Who, by the way, cannot run departments because they are not part of the permanent faculty governance system. So the few tenured faculty have less time for “research” (their own art work) because in addition to the teaching load, the admin load is spread among fewer permanent faculty. ROY: Squeak, What makes you want to keep making art? And…if you were not an artist what would you be? SQUEAK: I think being a surgeon would be fun. I have a very steady hand and an attention to detail, and the ability to stand for hours as well as concentrate during those hours. I actually am intrigued by medicine but I don’t test well and really art is the best choice for me. I am continually satisfied and happy being an artist. i love the ups and downs of running into a problem in the picture that i need to solve. I love a good challenge but I do not like to play sports or games. The other thing I love to do is laundry. I am very good at getting stains out of clothes. i could open up a laundry but I hate to fold so I will need to hire someone to do that. So, if you need your cashmere washed or anything else I can do it without ruining it, you will just have to fold it. So, you might say that laundry is my hobby. I would like to be a writer but my sentences are too short, they would be very short novels and even shorter stories. The other thing i think is fun is business, so i could do that. The great thing about being an artist is that you get to do all of that. One more thing I am very interested in, is what artists plan to do with their work and their archives after they leave the planet. I think artists should think about how they can turn those assets into something philanthropic. It is clear that America does not value the arts as much as other countries, so maybe we artists should lead the way. So Roy have you decided what will happen to your work after you are gone? Do you have any hobbies? cooking? When I interviewed for my job at UC Davis, Wayne Thiebaud asked me if I could cook. Cooking is so related to painting. I love to cook and eat! How about you, is there another profession you would like to be in? The thing is, what artist with studio and a way to pay for the habit (teaching is one way) who would really want to do anything else? To be an artist is to make your own world, your own reality…at least in the studio and in the objects we make. Roy: Yes, I do have interests other than making and appreciating art. I do enjoy cooking. When I cook I keep things simple but I do like the act of preparation and the time spent with friends enjoying food. I admit that I rather like the cleaning up process. I am reminded of my grandmother who used to say that doing the dishes was the time she got to enjoy the things she had. I am an avid collector of many things some African, some Latin American, mostly utilitarian objects, textiles, ceramics and some religious and ceremonial objects. Those things are very influential to my work. My husband Lari and I have a shared interest in cactus and we have an extensive garden. We also collect art, mostly works on paper. I haven’t given too much thought to what will happen to my work and our collections when we are gone. We do have an executor for our estate named and they can do with it what they think would be best. Fortunately, they are very involved and knowledgeable about art and the art world so I am confident that it will be well taken care of. As I am the executor of the Estate of the artist, Emerson Woelffer, who was a friend and teacher of mine, I am aware of the work that managing an estate entails and don’t really wish that on anyone. If I wasn’t an artist, I would be a dealer, but not of contemporary art. I would sell ethnographic material. Although, I am afraid that I wouldn’t make much money at it as I would probably have a hard time letting go of the things I had. I have a very intense relationship with objects. Squeak, you are right about artists having a good life even with the frustrations that are an inherent part of the creative process, I am most happy in my studio. Teaching has been both a great distraction and an incredible source of inspiration and as you noted it does allow us the freedom to work in our studios more than other ways of making money. Founded in 2005,PULSE is as an established part of the annual art calendar with editions in New York and Miami Beach.